dill leaves recipes | Indian Suva Bhaji, Shepu recipes. Suva bhaji or dill leaves is essentially a fresh herb used extensively in Indian cooking. Dill leaves are used in Indian Snacks, Indian Salads, Indian Soups and Dals. Dill leaves are used in Indian snacks in very small quantities because of its wonderful strong flavour which enhances the taste. This brown bread paneer cucumber and dill toast recipe is healthy and fast to make for your kids. Chola Dal Dhokla recipe is loaded with greens like spinach, methi and dill and used chola dal. This is a healthy breakfast dhokla to have. The combination of rice and urad dal in the batter makes the Dill Dosa recipe a good source of vegetarian protein. Dill adds some iron to the equation, helping you improve haemoglobin levels too for having a dosa for breakfast. Dill leaves add a great flavour to Dal and kadhis. Try our zero oil suva masoor dal reicpe where the unique combination of dill with masoor dal gives this recipe a distinct flavour, which is boosted by the addition of garlic, green chillies, onions and a tempering of cumin seeds. The earthy taste of masoor dal together with sweet-tasting suva makes this a real delicacy. Suva Moong Dal recipe is a tasty and healthy treat, with the pleasant taste of cooked moong dal and the herby taste of dill, perked up with a simple tempering of cumin and onions. Dill being alkaline in nature, this dal is a "go for it" dish for those who complain about acidity. Onions too are very effective against acidity, and this satiating dal is only mildly spiced, so you can enjoy it comfortably without harming your tummy. Suva bhaji lends a lovely taste to salads. My favourite tossed salad with no cooking made very easily is bean sprouts and suva tossed salad. Suva, tomatoes and bean sprouts combine beautifully with salt and lemon juice in this tangy, crunchy salad. Sweet beetroot and perky dill are a wonderful combination in beetroot and dill salad recipe, both by virtue of their contrasting colours and their complementary flavours. With a simple yet tasteful dressing of mustard and olive oil, this combo transforms into an aesthetic beetroot and dill salad. Yes, dill leaves made a great addition to rotis. Mouth-wateringly tasty Suva buckwheat rotis flavoured with aromatic dill leaves, this recipe is a delightful treat for your palate and your stomach. Made with alkaline flours like buckwheat and jowar, these rotis are spiced mildly with common ingredients like green chilli paste and a dash of pepper. Opt for this low-fat, high-calcium dip to accompany your snacks, to make the most of the nutrients while being nice to your waistline! The Suva Paneer Dip recipe is also easy and healthy quick snack to prepare. Curd and paneer are mixed well and dill leaves are added for a nice herby flavour. This aromatic dip tastes splendid with carrots or whole wheat breadsticks. We have a dill dip made with hung curds. The inherent richness of curds and cream is perfectly complemented by the distinctive flavour of dill leaves. A dash of pepper, green chillies and lemon juice complete the magical experience of this dip! Dill Leaves ( Suva bhaji, Shepu) : Our body needs to build white blood cells (WBC) to strengthen our immune system. Dill leaves with its loads of vitamin C helps us achieve this goal. Dill leaves are rich in antioxidants Vitamin A and Vitamin C which prevent or stop cell damage in your body and thus lowers the risk of chronic diseases like cancer, diabetes and heart disease. 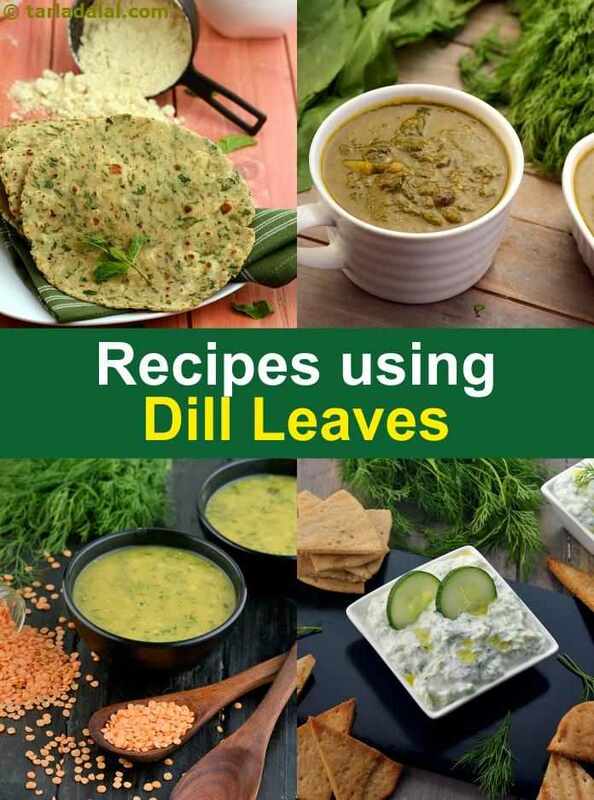 See detailed benefits of dill leaves. Enjoy our dill leaves recipes | Indian Suva Bhaji, Shepu recipes below. All time favourite with a sprinkling of iron strength! Dill, besides making this recipe colourful and interesting also loads it up with iron. Have you ever imagined steaming paneer?! in this innovative recipe, a collection of vegetables and dill leaves add colour to the dumplings, while oats and semolina add the crunch. The temptation multiplies when complemented by the spicy sauce. Don’t underestimate the humble sandwich! choosing the right breads and stuffing can result in rather exotic creations such as the sesame bagel with cucumber and sour cream. While the same dish can be prepared with burger buns, using sesame bagels gives it a brilliant aroma and flavour. Brimful of nutrients — nothing can describe the hari bhaji better. Loaded not just with vegetables but also the abundant goodness of spinach and herbs like dill and mint, this recipe is so tasty and wholesome, you cannot wish for anything better! There couldn't possibly be a better choice than a cream dressing to accompany this delicious salad. Succulent baby potatoes coated with dill, parsley and cheese. The herb potatoes can be enjoyed as cocktail snack or as an accompaniment to a main course or with cheese fondue. Quick as a wink to prepare, everyone is sure to enjoy these delicious, cheesy herb flavoured potatoes. Marinating the cucumber slices in vinegar is essential as it is this step that gives the salad a distinctive tangy taste. Relish a delightfully new flavor by throwing in a fistful of dill leaves into pressure cooked moong dal. A tadka with spices and onions complement the dal-dill leaf flavors and make your mealtime zara hatke!